Tomorrow is Twelfth Night. Traditionally the last night of merry-making before the Christian feast of Epiphany, it precedes the 5th January, the last of the Twelve Days of Christmas. Your blogger is old enough for Christmas to have been a predominantly religious celebration in her childhood. It wasn’t an ascetic one, there was too much of the pagan in it for that. All that food and drink harks back to ancient Saturnalia as well as older, pagan feasts which celebrated the Solstice. 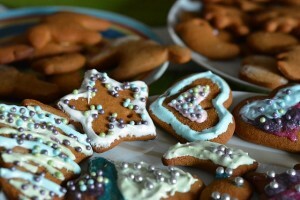 Nonetheless Christmas was a serious and specific liturgical Christian festival, whatever older traditions it encompassed. Rather more specific and liturgical than it is for many British people today perhaps. Its Twelve Days, formerly called Twelvetide, included the Nativity, but were all Saints Days, so monks and nuns were not obliged to fast upon any of them, perhaps another origin of the conspicuous over-consumption during the holiday. Twelfth Night signalled the approach of the end of the feast. Shakespeare’s ‘Twelfth Night’ was written to that end, though it was first performed on 2nd February 1602, or Candlemas Night, which was then the day on which Christmas decorations were removed. In old English tradition, misrule ended at Candlemas, having begun on All Hallows Eve (31st October, which was also the eve of Samhain, the Celtic pagan religious festival). The play, sub-titled ‘What You Will’, incorporates elements of misrule, as hierarchies are turned on their heads – a woman becomes a man, a steward believes himself about to be ennobled and there are lots of tricks and japes. Yet I always find the tone of the play melancholic. Suitable for the end of a holiday. Today, the twelfth day is when the Christmas decorations are removed and, like the Elizabethans, many would say ill-luck will follow if they are left for longer. Of course, decorations are different today. Tinsel until February would tax the patience and the eye, and, given the preponderance of edible decorations in the past, I hope these elements were eaten rather earlier. Either that or food poisoning. The tradition of edible decorations is still going, in the form of chocolate tree decorations and in traditional round cakes like Roscon de Reys in Spain or gingerbread in middle Europe. 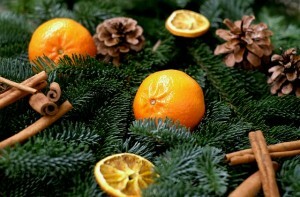 But, sensibly, these are eaten on Twelfth Night or the Twelfth Day, not Candlemas. In Jerez 5th January marks the end, not only of Christmastide, but also the holidays – Spain does not, by and large, go to work between 25th December and 5th January. Traditionally, 5th January was when children opened their Christmas presents, not Christmas Day. On Tuesday two large processions, one in the morning, one in the evening, will weave through the town with music and floats. Sweets are thrown into the watching crowds, symbolising the gifts of the Three Kings. I can attest to the generosity of the sweet throwers in the past. Walking the processional route the following day, before the street cleaning machines get to work, is a sticky business. 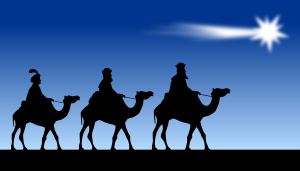 This year, as usual, the Cavalcade of the Three Kings will process along Medina at the top of my street and it will smell of sweeties for some time. You can find more details, including a video of last year’s parade, here. But in the absence of processions, prepare for the twelve drummers drumming ( or, as it had used to be, Lords a leaping, there were originally twelve of them too ). The first written version of ‘The Twelve Days of Christmas’, originally a children’s chant, goes back to 1780 in a book of children’s rhymes, but it is almost certainly older. List songs appear at Christmas in different languages and traditions, though the order of the ‘Twelve Days’ list has changed over the years. I wonder if the ‘drummers drumming’ harks back to older traditions too. 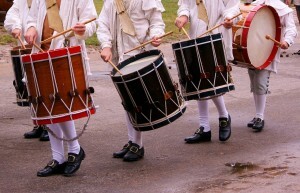 Drums have been used to celebrate a holiday for millennia. 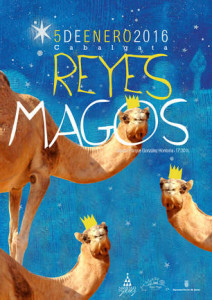 In Jerez, however, the zambomba drums come out before Christmas, not on the Twelfth Day. Enjoy the final celebration. The Story Bazaar wishes a happy and a prosperous New Year to all its readers. If you enjoyed reading this post you might also enjoy December – Advent Zambomba! This entry was posted in History and tagged History by juliej. Bookmark the permalink. I wish a prosperous New Year to you too as I wait for the baker to bring out one of those wonderful “Roscón de Reyes” to taste with my girls. Two daughters and a wife waiting at home… All the best Julie.